Summary: The heroes interested in the 'Network' that has been building, and turning that into something much more, come together in the Perisphere to discuss it. That threat was Godzilla and only by working together was the King of All Monsters defeated and the city saved. Since that time the idea of a network - a grouping of heroes - has grown. "Thank you for coming." Moon Maiden says as her lunarkinetic powers manuever trays ladden with healthy snacks and bottle of water towards the assembled heroes. "Most of you know, at least one of us from personal experience, that the world's greatest heroes once met here. They were united against the greatest evil this world had ever known. I thought it was appropriate we meet here as well, at least for the first time. We're here to discuss the network of heroes we've been building and to decide what we want it to be. We should probably start with introductions." Laurel takes a breath. "My name is Laurel. On Earth, my name is Laura Klein. My adopted father is Hugh Klein, the astronaut and the last man to walk on the moon. I'm also known as the Moon Maiden. I was created by the Hundred, a sect of Roman alchemists who believed in peace and equality. My mission is to encourage and grow those qualities here on Earth. I really am from the moon. I'm one of two people who live there." She pauses. "Sort of. Thank you all for coming." Amongst those assembled, Power Woman accepts an apple and a bottle of water, but holds both for now rather than opening one or biting into the other. Best not to talk with her mouth full, after all. She does stand up, to make sure everyone can see her, but doesn't bother lifting off the ground, though everyone present surely knows she could. "I am Kara Zor-L, of Koran, the moon of Krypton. I've taken the name here of Power Woman. I am descended from a house connected to that of Jor-El of Krypton, who was Superman back when this place was last used as a gathering place for superheroes." Kara pauses for a bit, to let everyone absorb that, before she bothers with anything more. "Most of you will know from the news that Krypton was destroyed. I was launched in a space ship before that happened, and I was raised here on Earth as a human daughter, adopted by two very wonderful human parents. Now, I do what I can with my abilities to live up to the example set by Jor-El many years ago, and honor the work done by all of our predecessors. And I am rather looking forward to the chance to work with and get to know each of you better, and help any way I can. I'm very glad that each of you is here today." When he first arrived, Captain America spent a few momenmts walking around the Perisphere. He initially had that look of fond wistful rememberance, but it gave way to a frown at the sight of the cobwebs and disrepair - and especially at the graffiti. He remembers when it was shiny and new; when its technology was cutting edge; when it's shape symbolized not only the future , but a spirit of hope and unity that was shared by its colorful inhabitants. Luckily before Cap can get too melancholy, Moon Maiden is speaking - perhaps taking the first steps toward reviving that spirit - and the frown is replaced by the same soft grin Steve wore when Power Woman spoke to the crowd at the bridge. "I always feel silly introducing myself," the Living Legend of World War II says when his turn comes. "I'm Captain America. I'm here because I think this is an idea the world is ready for again. An idea the world needs. I believe in it, and in another idea. The idea that a single individual who has the right heart and the right mind that is consumed with a single purpose, that one person can accomplish miracles. Give that person a group of aliies with the same conviction, and you can change the world. And the people in this room definitely have that conviction." Diana is dressed in her battle garb, figuring that everyone would be attending in their costumes. As all the heroes assemble, she looks around and takes stock of them, the only one she hasn't met yet being Batman. Regardless, there's something powerful about this moment; now she knows how her mother felt all those years ago with the Justice Society. And she feels pride in herself, that she is considered worthy by others to continue this legacy. As she feels her time has come to speak, Diana stands up, looking over the assemblage. "I amd Diana of Themyscira, Princess of the Amazons and their Ambassador here in Man's World. I also have the honor of carrying the name Wonder Woman, by which my mother, Queen Hyppolita, was known when she faught alongside the Justice Society in the Second World War." "Many of you I have met. Some of you I have had the honor of fighting alongside to protect this land and it's citizens. Some of you, I know by reputaion or by the stories my mother told me of her time here. And I consider it a great honor to be asked to join this great gathering. I pledge to you my skills and strength, along with whatever assistance my position may be able to provide." Jean telekinetically plucks an apple and a bottle of water from the tray, steepling her fingers in front of her as she glances around at the others. She glances over at Kara and Laurel, before blushing a bit as Captain America speaks, "Well… I feel a little mundane compared to all this." She smiles a touch, and looks at the others, "I'm Jean Grey, or Marvel Girl, as my alter ego might be known. Though I haven't been doing all that much yet, compared to some of you." Her eyes flicker around at the others, "Whatever help I can provide, I'll be more than happy to give it." She smiles at the others, "And it is definitely a pleasure to meet all of you." As the others discuss matters, Batman roams darkly around the room. The white lenses over his eyes pause every so often as he inspects the area. His thoughts are to himself, however as he remains quiet. He's incredibly tall, and the long ears atop his head making him look even taller as he makes his way around. A long black cape is worn over his shoulders and brought down to a close in front of his chest. The cape is perfectly tailoered, coming to a stop just above the ground and as he moves he almost seems to float. The others talk and share things, but Batman remains quiet. Pepper has barely looked up from her phone during the introduction. When thing comes around to her, in fact, she has it to her ear, holding up a finger for the assembled superheroes of the known world to…wait a minute. "I don't care what he says, Emilio, the quote was two million. If he was going to go over, he had ample opportunity to file a P458 adjustment form weeks ago. He'll just have to cut costs. Look, I'm in a meeting, just drop the rest in my inbox and I'll get back to you later…" she says, finally turning her phone off. The redhead runs a hand through her hair, pushing a stray lock behind her ear. "My apologies, I'm afraid I got behind on a few things today and I've been trying to catch up all day. Blame the Japanese stock market. I'm Virginia Potts, but most people call me Pepper. I'm CFO of Stark Industries and am here to both represent the interests of Mr. Stark in his role as Iron Man and as the major funder and patron of this particular enterprise. I'm here to provide logistics, support and practicaql organizational skills. I have no superhuman abilities, nor do I have interest in any should they be offered. Please make sure to leave any contact information or materiel requests with me before you leave. If someone needs a special kind of restroom or is allergic to lead, now is the time to tell me, not during construction." "I'm the Black Widow. If you've never heard of me, that means you've lived a clean and upstanding life, and congratulations. I'm here because…" She hesitates for a moment. It's a bit hard to put this into words. "Because when a lot of well-intentioned people with good hearts try to jump in and fix every problem in the world, it rarely goes flawlessly. I thought I might throw my weight behind smoothing that road." "Ms. Potts has a number of super powers, trust me." Laurel says with a bright smile. "For those of you who don't know, Marvel Girl is a telepath. I'm sure she won't read anyone's minds without permission but she can network our minds together in the field. A very, very useful skill. Godzilla might still be rampaging if not for it." Laurel settles down on the edge of the central stage area, sitting comfortably. She grabs a bottle of water. "And the gentleman who didn't introduce himself appears to be the Batman - the legend of Gotham City." She twists the cap off her bottle and sets it down next to her. "We have a lot to discuss. What do we want this group to be? How formal? How organized? Do we want a headquarters? Tony Stark is assuming we do and working, through Ms. Potts here, to get us one. If so, what do we want from a headquarters? Please, feel free to speak your minds." "Speaking from a personal and philosophical standpoint," Diana says. "I think that we need to be careful of our scope. Many countries and areas may welcome us, but we cannot and should not be active in places that do not wish for our assistance. As I recently told a friend, we must be ready to help, but we cannot force our help on people." She turns to Pepper Potts, smiling a bit. "Mr. Stark's generousity is as great as his fathers, from the stories my mother told me. Even still, I think it would be prudent if there were other financial backers to this venture. The more number of supporters we have, the more we look like a becon of unity and an inspiration for cooperation. Themyscira is willing to provide funding for this group as well." Jean blushes a bit at the mention of her powers, "Well, yes, and I also have telekinetic powers as well, but I would never actually probe a teammate's mind without permission." She ahems a bit, "I suppose my first question would be transportation. I mean, I live in Gotham, and unlike some folks I don't exactly have a power of rapid transit. Or a jet." She grins a little, "That's a concern… and another one would be, if we're going to be a team, we're going to need to train together so we can be ready when another radioactive iguana decides to try and eat New York." She hmms and looks at Diana, "My sentiments, exactly. Though we might want to be cautious about taking too many people in, too fast. Otherwise we might lose focus." Captain America smirks behinD one glove as the Black Widow finds a diplomatic way to say 'I'm here to tell all you optimists and idealists when you are full of it'. "We want a headquarters," Captain America says. "Well, alright , *I* want a headquarters." He waves a red-gauntled hand around the room. "In addition to just having a place to plan and reseach and prepare, this place gave wildly different people a sense of belonging, and emphasised what they had in common, not what seperated them." Cap nods at Wonder Woman and Marvel Girl, "I couldn't agree more about financing, and jusrisdiction." He gives Jean a wink, "although I think talking about 'not being too big' in this building is a bit of a juxtaposition." Power Woman nods in agreement to much of what has been said. "Black Widow is right. I won't deny, I want to see the world a better place, and I have a lot of very big ideas about what that means and what to try. And I won't deny I want to see those to reality. But as much as I did grow up here, I have no desire to play God. I want to offer the ideas and possibilities, not shove them down anyone's throat. If a jurisdiction doesn't want us there, we should do the best we can to respect that. But I won't lie: if lives are in danger, and I can do anything about it, I'm not sure how much I could bring myself to do nothing just because the rulers of a country didn't want me there." Honesty, right up front, even if it's not very popular. "I vote yes on a headquarters. A part of me would really love to make it this place. But I'll also admit a part of me would like a place that isn't tied to any one country." Pepper Potts had been peering at Batman, the supposed legend and probably the individual Pepper trusted least in this particular arrangement. Legends were all well and good, but she preferred hard numbers to shadows. Whatever this man's capabilities, he was claiming a rather provocative identity. At some of Jean's questions, though, "I can probably help with some of that, Miss Grey. Stark will be constructing a team headquarters and operational center. We will likely be providing transports as well, two ten person transport vehicles powered by clean ion energy for flight and another designed specifically for potential underwater activities. Whether or not you wish to partake of the facilities provided will, of course, be entirely up to you as individuals, but, I will say, you won't find anything better. Anywhere. Ever." she says with a soft smile. "Funding will not be an issue," Batman says quietly but firmly. "… I know of an area on the Moon that has oxygen." Laurel says. "Besides my personal Villa, I mean. An entire city, actually. There's someone living there but I don't think he'd mind if we used it. He'd be a good neighbor. Never talks, never complains. Just sort of sits there and watches stuff. We'd just need a quick way to get there and back. I don't suppose anyone is hiding teleportation technology?" Black Widow starts listening, and her expression becomes more… amused, perhaps. Or perhaps slightly incredulous. "I think the question of organization is an important one. What sort of group are we going to be? We might be a loosely-affiliated group of save-the-world buddies. Do we have a leader? Elected or appointed? Do we all get a shiny patch to wear on our jumpsuits?" Her eyes flick over to Batman. The shadow speaks, apparently. "No teleportation technology, no. But I can help with advanced computer technology, and scanners. And a spacecraft, although I think it would be rather cramped for any of us. It only had to carry the computer core, and me as a baby, the last time it flew." Power Woman smirks at the competition that seems to be coming up, but stays out of it, largely. She wants to hear from everyone, first. Diana looks over at Batman as the Dark Knight speaks, raising an amused eyebrow. "The benefits of a headquarters are obvious," Diana says as she returns to the genral conversation. "A facility to house us, areas to conduct research, a hall for training, a place of healing. All of these things are neccessary if we are to succees. While I certainly cannot refute that being located on the moon would certainly be a neutral location, efficient transportation would be a subject of concern, wouldn't it? And as for leadershiip, I would propose a democratic model, where one of us is proposed and elected to serve a set term, then another is chosen to lead us. It would give us a certain freedom of creativity, since differnt leaders would have different styles and views of situations given their individual experiences." Jean nods, and blushes quite a bit when Cap gives her a wink, stammering a little, "Well, I… ah, yes." She glances over at Diana, and hms, "Seems to be a pretty sound idea, really. Though, I mean, we have to have something to call ourselves, if we're actually going to be a team or organization, right?" She looks around at the others, "Because how we name ourselves is going to go a long way to how people perceive us." Pepper Potts arches an eyebrow at Batman's assertion, "If I would be permitted, funding should likely be coordnated and directed, rather than coming in haphazardly and from potentially," again, a look at Batman, "dubious sources. Technologies, too, need to be coordinates for compatability and, of course, to make sure any potential copyright and patent issues are properly managed. I understand that everyone wishes to help, but please don't go out of your way to make more paperwork simply to prove that your cape is longer than the next person's." "Maybe something more down to Earth is a good idea, then." Laurel says. "I agree with Diana's idea on our organization. We should be equals. Each of us has something amazing to bring to the group. If we're going to be organized and have a chairperson, voted in place by consensus." She pauses and then laughs. "I was made by people who came from the first Republic. I'm a big believer in democracy. And Marvel Girl is right, too. We need a name. As amazing as the All-Star Squadron, the Seven Soldiers of Victory, the Invaders, the Justice Society… all of them were… I think we need to be something new." "I was invited here, Miss Potts. With or without your permission," Batman replies. "At ease, people. Let's not start arguing whose money is greener and who's cape is shiny than whose," Captain America says to Pepper and Batman. Steve is insanely curious as to whether this man (assuming Batman is human) is related to whatever was calling itself the Bat in World War II. Whoever or whatever it was, 'The Bat-Man' never answered President Roosevelt's call, and The Green Lantern of the day - a Gothamite - said even with his amazing ring, never caught sight of him…it. The dark and spooky routine both fazes him and not. Cap saw The Sandman do it, and then there was Mister Bones. For that matter, Natasha. But Batman brings it to a new level, even sitting here in the 'flesh'. "I am all for democracy, but I am not quite sure wqhat a formal term leader would accomplish other than maybe to observe rules of order during a meeting. I think we might get away with field leaders or mission leaders as the situation warrants, precisely to make use of those strengths and experiences." "Marvel Girl beats me to my next point. A formal leader might also just be a face for the public and some of us operate better in the shadows. If we are going to have a public face, than not only is the name mportant but so is the place. Maybe we need a public place, and one not so public, where both fans and foes are less likely to target us." "If you think anyone in this little group is dubious," Black Widow puts in, "not only am I upset I'm not on the top of that list, but I think it's not going to be a /great/ idea to include them. Unless we're just some loose league of justice, we're going to have to at least trust each other to hold to the same code of conduct. Antagonizing each other isn't the best way to start. And what if we let someone in who tarnishes our presumably good name?" Pepper Potts looks at Batman mildly, "Wasn't suggesting you weren't. I do notice, however, that you are far more opaque and swathed in mystery than the rest of us. That's your choice and your right, but I won't have Stark Industries withstand potential IRS or legal ramifications simply to provide you with mystique. If you can provide funding through legal and above board channels, I would absolutely welcome not having to provide more funding out of my already overstretched operations budget." "Batman's intelligence stopped Godzilla." Moon Maiden says. "He was willing to die in that battle. To protect others. That speaks to his credentials. If he wants to keep his secrets and stay quiet… well, like my dad always said. You can't say anything foolish if you say nothing at all. I saw Black Widow do the same with the giant manta robot thing over the East River the other day. Pepper, we can trust both of them. Please, I know you're thinking like a CFO but you can trust these people. Please. Relax." "This is America. Someone make a political action committee and people can throw all the anonymous donations into it that they want." Black Widow makes a flicking gesture with her fingers. "But we need to ensure that we have a common goal. A common purpose. Something that connects us beyond a penchant for really, really tight pants." Jean hmms, "Which I suspect was the point. I think those of us that were in New York can attest to the fact that Batman, regardless of who he is, has access to a fair amount of resources that can help us." She glances around at the others, and nods in agreement with Moon Maiden, looking at Pepper with a wry expression, "Though, if you happen to have any paid psychiatry internships, I'd love an application." Her lips quirk, as she's only semi-joking. "I choose to view no one as dubious, until I have reason to based on their actions. Right now, from what I know of any of you here, that's none of you." Power Woman speaks up. "I thank you, Ms. Potts, and your employer, Mister Stark, for your generosity. But I also don't want to see this team become some kind of public relations gimmick, or wholly-owned subsidiary of anyone, no matter how well-meaning." Kara considers that for a bit, and then offers a potential solution. "I'm no business genius. But maybe we could establish a non-profit, with a board made up of members. Then anyone who wishes to contribute can do so - materially or monetarily - but it gives them no say in how we operate, or how we use what they give us. That said, I do think that a public face is important. I want the people to trust us, accept us. There will always be some fear, but I'd like to manage that, as best we can." "Having a rotating leadership is more than just having a face for the public, Captain," Diana says. "It gives us all a certain responsibility, since any of us could be leader. It would allow each member to demonstrate their abilities, as well as possibly helping them develop personally, finding tallents they may otherwise know they have." As the rancor starts to build, Diana holds up her hands. "Peace, please. We are all allies here. We may have unfamiliarities with each other, but let us not cast any aspersions. Something of this nature is too important to be derailed by petty squableing before we start. Obviously, we would have a vetting process for both members and finaciers. For that, I would say that we need to have a form of charter to state our principles. And I believe the Black Widow had an excelelnt suggestion for a name: a Justice League." Batman doesn't bother to respond to Potts' barbs regarding secrecy. As others suggest, he has his reasons and they are his alone. Instead, as Diana asks for peace, he literally turns and walks away around the circle, turning his back on Pepper. Captain America blinks in surprise when it takes Moon Maiden and Wonder Woman two more olive branches to diffuse the room after his 'at ease'. This is certainly going to be no Invaders. "I like the name," Cap says. "It shows we are about justice, and not some band of vigilantes - avengers taking matters into our own hands. And it is a good homage to the Justice Society. Although, I can't believe I am the one saying this - if we really want to keep neutral perspective and be welcomed everywhere, maybe we better not be 'of America' this time around." That brings a smile to Moon Maiden's face. "Justice League. I like that. That's a fantastic place to start. We'll need bylaws if we're going to be an organization." She ponders for a moment. "I'm guessing the old Society had ones we could use as a template." She taps her lips with her fingertips then continues on. "As for leadership, maybe a chairperson to handle administrative duties and speak to the public but in the field, well…" She shrugs. "Captain, I think most of us will be looking to you for our marching orders no matter whose name is on the office door." Pepper Potts purses her lips. Only people who dress up in spandex and run around rooftops would think taxation, budgets and funding streams were petty matters. Batman's gesture isn't lost on her either. Well, it only goes without saying that anyone who'd been operating as long as Batman was probably a sexist pig. She would manage affairs as she saw fit and, if the Bat interfered, she'd deal with him then. She was fully versed in forensic accounting procedures, after all. For all that, she keeps a pleasant expression on her face. Batman has, after all, been identified, labelled and filed. No need to think of him until need be. Batman stops walking and stands behind Captain America, off his right shoulder. He tends not to discuss important matters with secretaries. He doesn't start now. Jean hmms, "Justice League, I like that. Though yes, keeping it simple and to the point seems to be best." She glances between Batman and Pepper, and while it doesn't take a telepath to notice the tension there, well… it definitely is /more/ noticeable that way. "So, we have a name, and it sounds like we have some funding from… various sources. Next thought?" She looks mostly at Cap when she says that, though she does include the others, notably Natasha, with her gaze. Diana smiles a bit. A name that everyone likes; progress! "I would then like to propose that we begin working on two things. First, a charter outlining our goals, our self-imposed limitations, our membership requirements, and proceedures for revoking membership. Second, an establishment of a supporting foundation for those who wish to contribute to the maintenance of this organization. I believe Ms. Potts will be of immense help on this second front. Withthe foundation establishment, we should also have rules for who controls the foundation and who may contribute funds." "I think all of those sound like excellent suggestions." Power Woman offers, smiling. "I hope everyone will pardon me if I sort of 'skip ahead' a bit. But I'd like to put forward a nomination for our first leadership position holder. I'd like to nominate Diana as our first Chairwoman." Not that she feels there aren't quite a few others who could do the job, and do it well. But best to start it off right. Right? Shooting a grin at Moon Maiden, Captain America says playfully , "I will happy to bark orders at everyone whn the time comes. But," he continues prfectly timed with Batman's shadow falling over him, "I suspect there are others here who know how to plan a battle. Still, I understand what you are saying about one voice and a well-oiuled machine. I'll do my best to learn what everyone is capable of, and take ideas." He turns to Jean again, "And this will mean that training you were talking about." At Diana's mention of a charter, and rules of membership he rolls his eyes. "I hate beuracracy. That's why i never got promoted past Captain. I'll let everyone hammer it out and look it over after. I'll know fair when I see it, I hope." "Second," Batman says in response to Diana's nomination. Laurel agrees. As she said, she's fairly sure it will be Captain America leading in the field. Or perhaps Batman. But with the strong personalities present in this room? Perhaps a peacemaker is what is needed off the battlefield. "All those in favor?" She raises her hand. "I think it's wise to have specialists. And I do believe everyone here has a specialty. Mine is letting other people take things head-on." Black Widow folds her arms, but she nods assent to the nomination and glances around to see if there will be any others. Jean raises her hand, "Definitely in favor. And Captain, I had a pretty extensive amount of training as part of my… ah, schooling, so I can work up some sort of training regimen if people want. I'm sure that we're all rather skilled individually, but teamwork is something else." She smiles, "I, for one, wouldn't want to be clonked by a shield toss because I zigged instead of zagged, after all. Though, if I do coordinate for us, I want you to know that it's basically a 'speed of thought' comlink, more than anything else. No one can pry for information through the telepathic link I set up." She seems to direct that more towards Batman than anyone else, as if thinking people might be a little paranoid about her 'getting in their head', some moreso than others. Power Woman nominating her as Chairwoman actually takes Diana by surprise, and it takes her a few moments to recover. "I am honored by the nomination, but before I accept something like that, I want everyone to be clear of my status. I am both an Ambassador and a Princess of my people. And I understand that much of the public is uneasy when it comes to monarchies; in fact the United States made it's own statement some 230 years ago. Also, my nation does not accept men within it's borders, which is something that many disagree with. Of course, I would never impose such things here, or even suggest them. But I want to make sure that everyone understands that I am not without my detractors in the public before you vote. But with that in mind, I would would be honored to accept the nomination." "I'm sure we've all had our share of bad press. Well, those of us in the public spotlight anyway." Moon Maiden notes. "That doesn't take away from your capabilities, Diana." She clears her throat and then says. "All those in favor of Wonder Woman as our first chairperson?" Moon Maiden raises her hand. Captain America raises his right hand. "We'll just have to recruit some more fallas, then. "Aye." Black Widow raises hers without comment, glancing sidelong at the Bat just for a moment. Also without comment. "Aye," Batman responds, not seeming to notice Natasha's stare. "I nominated you, Diana, and I did so knowing your status. I still vote aye, and applaud your open honesty." Power Woman affirms. As the decision is made by majority vote, Laurel floats off the stage and takes a seat on one of the benches, next to Power Woman. "The floor is your's, Madame Chairperson. Congratulations." Diana nods to Moon Maiden as she stands back up. "Thank you all. I will do my best to return the trust you have placed in me and to set an example for all the other Chairpersons to follow." She looks a bit flustered as she takes a deep breath. "Very well. I suppose the first order of business is to find a home of us. I would like to put forth the motion to acquire the Perisphere and use it as a temporary headquarters until a more permanent solution is constructed. Discussion?" "You mean the Perisphere and the Trylon, but seconded!" Cap says with a big smile. "I'll get a bucket and mop right now, if you like!" "I think that's ideal. I don't feel any more discussion is required, on the front of the temporary headquarters. Though I am curious to hear any thoughts anyone has as to what the ideal more permanent solution might be." Power Woman mentions. "I know the moon isn't practical but I like the basic idea because it isn't in territory belonging to any country. Not American, not Russian, not European or Themyscirian. While we should respect borders we shouldn't be beholden to any specific country just because we have our headquarters there." Laurel says. "And I'm in favor of restoring the Perisphere. Even if we don't stay here it could become a wonderful museum again." Jean nods, "I agree with restoring the Perisphere… the Moon, well, I have some minor reservations about that. Mainly because I don't know if being that far away, literally, from Earth is necessarily a good thing." She shrugs, "But if travel isn't going to be a problem, then I think that would be fine. Restoring things here definitely works for me." "I do like the idea of something extraterritorial," Black Widow muses. "Antarctica isn't very convenient either, though. It needs to be something that doesn't take a week-plus to reach." Dina nods to the group decision. "All right, in that case I would like to ask Power Woman and Mr. Stark, being technology experts, to take the lead in restoring these facilities. If there are no objections, that is. I would also like to ask Ms. Potts, with the permission of Mr. Stark, to set up the framework for the Foundation that will financially support this group. Again, if there are no objections to that." "As to the subject of an extrateritorial headquarters," Diana continues. "If we have the capability of building on the moon, why don't we build a station or satelite in Earth's orbit? Are there not vehicles that could transport us as a group fairly swiftly too and from orbit?" "For what it's worth, I welcome the contributions of anyone else who feels they have something to offer on the technology front." Stark may not agree, but Kara isn't going to start getting territorial about this. "Maybe we can actually work out teleportation tech? That would make something like a space-based base of operations much more practical." "Getting a station - or the pieces of one - into orbit won't be a problem." Laurel nods in agreement. "Between us I'm sure we have more than enough power to do it cheaply." Iron Man, Wonder Woman, Moon Maiden, Power Woman? That's a lot of lifting power. The discussions continue on for a while, probably far oo long for Batman's tastes. But, ideas are discussed and a basic framework is hammered out. Finally, Diana takes a deep breath. "Well, I think we are all in agreement that this has been enough constructive debating for one night. I'm calling this first meeting ajourned, then. Let's meet again here in a few days to complete the groundwork. Thank you all for coming, thank you Moon Maiden for arranging this, and thank you all again for believing that we are all greater in unity than acting separately. Good night, all." Built in 1939 as the centerpiece of the New York's World Fair the Perisphere is, simply put, a giant hollow sphere that seems to float in a fountain of water. 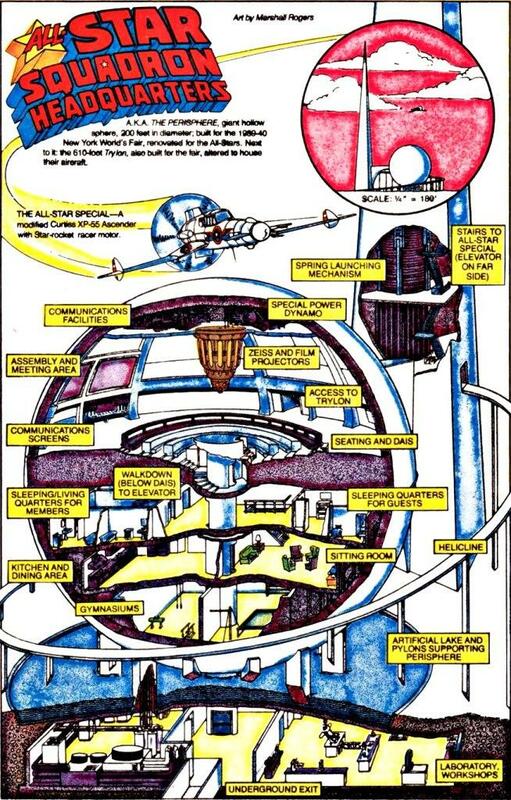 During World War II the Perisphere was upgraded to become the headquarters of the All-Star Squadron - almost every known mystery man and metahuman as part of a single task force - one put together by President Franklin D. Roosevelt himself. For decades after World War II the Perisphere remained a popular tourist attraction as it was turned into a museum that celebrated the strange and transient phenomenon known as the superhero. In time, though, the popularity waned. People stopped coming and by the late 90s the Perisphere had closed her doors and lately the city has talked about tearing the old girl down. Now, she remains sad and abandoned. Her once shining walls cracked. Her screens and technology, once the height of innovation, shattered and broken. Graffiti adorns the inner walls, hinting at visitors who are less and respectful. Still, if a building can have a soul, perhaps she is glad that, once again, if even just this one time, great and powerful heroes once again walk her hallowed halls.